Here at the Monash Sports and Aquatic Centre, a group of women are about to start a BodyPump class. And no, they’re not learning how to be plumbers. They will, in fact, be pumping iron. BodyPump is one of the most popular of the Les Mills ‘Body’ series of group work-outs. It’s popularity stems from its success at burning fat. 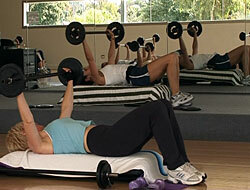 It is a 45 to 60 minute class, using barbells and adjustable weights in a work-out set to music. The weights increase resistance on the body and raise the metabolic rate so fat is worked off even faster. Named after the New Zealand athletics champion, the Les Mills organisation provides all the music and choreography for an effective work-out. To keep things interesting Les creates a new program every three months. Carol, the instructor, puts the participants through their paces. All the major muscle groups are worked in turn after an initial warm-up. In this session, Carol has started with a series of squats to get the legs working. She then gets the participants to work on their arms with a sequence of push-ups, arm curls and presses. A little bit of light stretching is done after each exercise to keep the muscles moving. Different muscle groups are exercised during the work-out by varying the speed at which each exercise is done. Carol calls out words such as “double” or “single” to the participants. The class is set to music and she is referring to the number of musical beats per repetition. So double doesn’t mean twice as fast, but twice as long – although, when you’re holding a heavy weight in front of you, it probably feels even longer! This is all hard work! By the end of the session most participants have opted for lighter weights. The music and the instructor’s friendly, extrovert personality help keep the participants going. Most of the participants are fairly self-directing when it comes to their weights. Most people are using weights specific to their needs. Some women choose to work with weights no heavier than five kilos, while a couple of women are waving up to 30 kilos around with no ill effects. The session ends with stretching and a relaxation session set to calming music. BodyPump is an equipment intensive work-out requiring weights, bars, mats, raised platforms and smaller hand weights. But the gym provides all of that so that all you have to bring is a water bottle and a willing attitude.